My relationship with triathlon has been a bit like a love affair with someone who you know just isn’t quite right but is sometimes actually quite a bit of fun. Although running will always be my strong and steady, triathlon is that guy who you’ll when your steady dumps you or you’re bored and need a change. Triathlon is exciting and challenging and keeps you on your toes. Triathlon is really only fun in the summer when the ocean is warm (ish) and inviting and there is enough sunlight to ride outdoors on weekdays. So each summer I go back to triathlon for my dose of fun and this summer is no different. 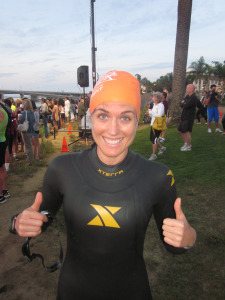 For those new readers, once upon a time (aka circa 2011) I had a full-blown relationship with triathlon. After 6 short weeks of training for my first sprint triathlon in July of 2011, I officially pulled the trigger and signed up for Ironman CdA which would take place less than 1 year later. Like an good love affair, I jumped in head over heels – I had no idea what I had gotten myself in to but I was willing to take the risk. Wetsuits and swim caps are cool! I dedicated a full year to triathlon and trained as hard as I knew how. I put together my own training plan and followed it nearly to a T. I trained very long hours, up to 21 hours a week and started my long weeks of training well in advance since I also ran a February marathon. Luckily I had my now husband Mike, best friend Asia and her now-fiance Jeremy to join me in this escapade. We spent countless hours training side by side, although an additional countless number of hours were spent training on my own. It was a long, exhausting (and expensive!) 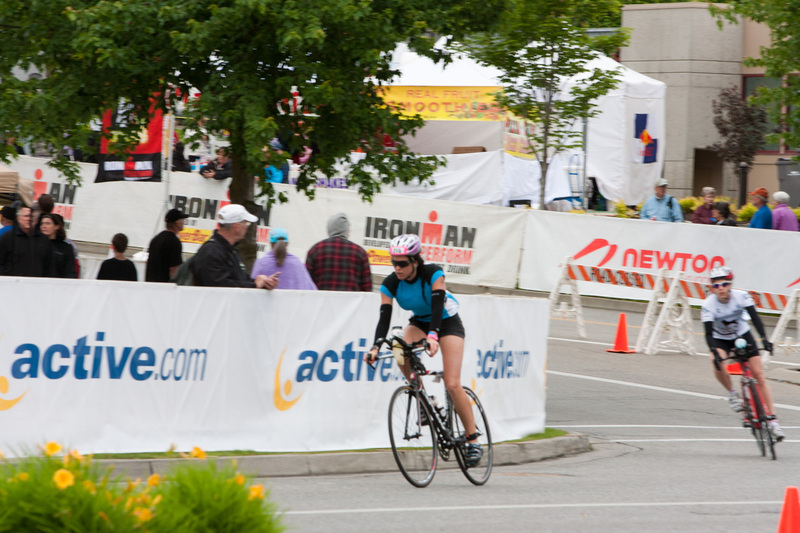 year, but it was all worth it when I crossed the finish line at Ironman Couer D’Alene in June of 2012. After the race, I took a few weeks off and then got back into triathlon temporarily at the end of the summer for one last triathlon, a sprint which I took 2nd in my age group in and decided to call myself retired. I was burnt out. I didn’t touch my bike or swim a yard in the pool for 9 months until last June when I started training for the Solana Beach Sprint Triathlon. I had a fun summer training alongside Mike’s co-workers as part of their Charity Challenge program, and ended it with a fun race. After that, the swim cap and googles went back into retirement along with my bike as I prepared for our September wedding. As I ramped up to train for the Phoenix marathon, however, I did start to incorporate some cycling into my training, almost exclusively on the trainer. So here we are. It’s June and I’m 2.5 weeks out from an Olympic distance triathlon – the San Diego International Triathlon. I have been riding about 1-2 times a week since the new year and of course I’ve got the running part down. I’m not completely worried about the swim, since it’s only 1000 meters and I was on the swim team in high school so it doesn’t take me much time to get back up to speed (although I’m still not really fast). I’m a little disappointed (and know I will be come race day most likely) that I haven’t been able to dedicate much more time on the bike but that was the choice I made when I decided to train hard for the RnR half as well as try to complete P90X3. No matter what happens at the International Triathlon, I’m dead set on preparing adequately for the Solana Beach Sprint Triathlon on July 27th. 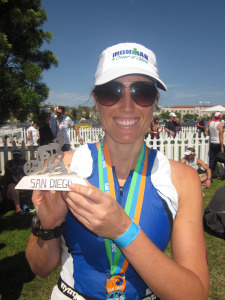 This is my favorite triathlon in San Diego – it was my first and this will be my 3rd year competing (and Mike’s 6th!) and it’s also a big event since so many of my friends from the triathlon community come out to either race or support. Mike’s company, the ACTIVE Network, is the main sponsor of the race, and his company puts on a training program for employees to prepare for the race. 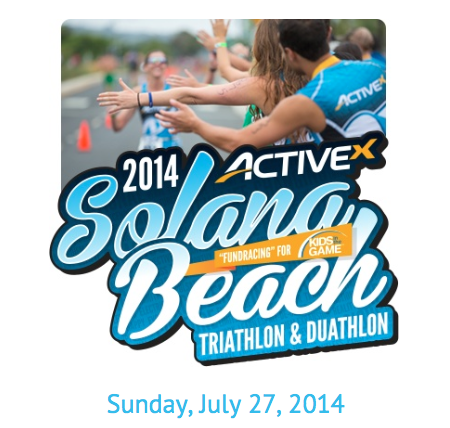 The Solana Beach Triathlon takes place in Fletcher cove. The 1/4 mile swim is a beach start – you run straight into the waves, swim to a buoy make one turn and swim to the next buoy and swim in. It goes quickly and is exciting – the beach start adds an element of surprise – some years the waves are calm and others they will swallow people up! The 9 mile bike course is awesome because it loops twice so you can see your friends and family a few times as they either cheer you on or whiz by on their own bikes. The two loop 3 mile run is also fun because you can scope out people in your age group and try to catch them! Another big milestone for this year – I will officially be in the 30-35 year old age group! Those 30-35 year old women are super fast so I don’t have high expectations to place in my age group (this is competitive race – last year I was 4th in the 25-29 group) but I’m going to put my best effort into the race! I’m still not exactly sure what exactly that training entails. I’ve put together a loose training schedule to get ready for the International tri – there’s not much to it since I have less than 18 days to go – but I may try to find a good plan online to help me with my final 5 weeks until Solana Beach. Or, the alternate – and currently my favorite idea – is to just train however I feel and have fun with it! Already this week since returning from Nashville Monday night I’ve gotten in 5 workouts and they have ALL been with a friend or a group! Now that is how I like to train! So here we go triathlon – let’s start this summer romance! To join me in this race and get $5 off, use discount code: NICOLESB5 . Sign up here. If you are a triathlete, do you train year round? Do you have a certain race you like to do each year? Ohhh reading your old Ironman posts now! That’s such a dream of mine someday. I wish you could be my swim coach! Love the comparison of triathlon to a love affair. So true. My affair was fast and passionate while it lasted! You will be fine in the 30-34 AG. I just moved into the 35-39 AG and that is where it is serious business!! Wildflower long course is one of my favorites. I also have an oly that I like to do every year. I like doing different races too! I try and swim year around. I work on my running in the off season because it is my weakness.